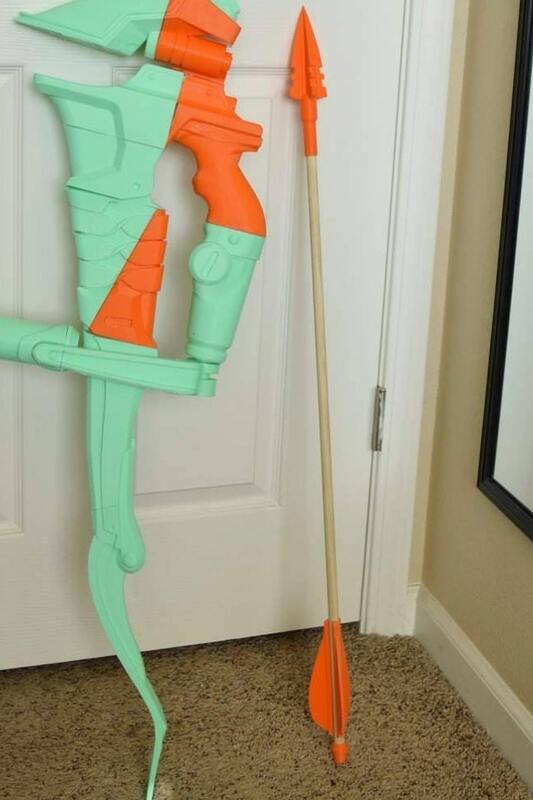 This is for a 3d printed Kit of the Classic Skin Hanzo Bow's Arrow. 1 Full Size Arrow Kit - 4 piece arrow Kit, included Arrow head, 3 fletchings and one arrow end. Printed to scale with the full size bow kit. 1 Small Arrow Kit - 4 piece arrow Kit, included Arrow head, 3 fletchings and one arrow end. Printed to scale with the small size bow kit. 3 Full Size Arrow Kit - 3 of the Full Size Arrow Kit. - this is a disassembled prop kit, it will come in pieces. -Items are 3d printed to order. -Disclaimer: It is a prop of a weapon, I am not liable for custom & import laws of other countries, if your country has restrictions to Replica weapons, it is your responsibility to inform us of any precaution we need to take. No cancellations no returns. Damaged items will be replaced. I loved this. I was so so excited to get it. The inside even has a small soldier bust. It was so neat to finally have in my hands and not just show a photo. :) I ordered this months ago and it was soo worth all the excitment. I was jumping up and down and I could not open it fast enough. It was quite large which is gonna be so very awesome. It came with a dice tray for the bottom where the dice end up and I'm super happy about that. It was a good price and the texture of it was perfect for throwing my dice down. 1. I don't really like how the dice tray attaches. 2. The package wasn't shipped with correct weight so I had to pay an additional fee and pick it up from post office. It was shipped at 8oz and post office measured it as 1lb which is twice that. Ordered this on December 25th did not receive till two months later. They did communicate that they were behind schedule however when I did finally receive item it was without half my order. They had a fast response timely messages and immediately set me out the missing dice tray however I have no received that and it does not fit the tower that they had previously set us. We do apologize for running behind, as stated we did communicate that we were behind, which we offered a refund if us running behind did not work. We were unaware that there was a labeling issue that caused some of our orders with Dice Trays and Some orders without Dice trays of the same color to have their labels reversed. As soon as we were made aware we corrected the issue. We ask any customer who is having issues with sizing or any other mistakes to contact. All trays and towers are made from the same 3d model and should fit together, the tower is placed on the tray, If they do not, we are happy to correct this issue. But we do need to be made aware of it. Sadly before this review were were not told about it. Shipping was on time, sword arrived in ten pieces, padded well, no damage. I did not have the piece finished or painted. My only trouble has been with the fitting of dowels & that the design leaves the sword weak in one spot. The holes for the smaller dowels are too tight and don't fit the corresponding dowel size unless you sand the dowels down. I had to switch to the next smallest dowel size (which leaves a gap on the inside). Also, a big dowel connects the handle/hand guard pieces into one, and small dowels connect the blade pieces into one, but there is no way to connect the handle half to the blade half using dowels. Only with bonding glue can you connect both halves. This makes the design weak at its center. I wish I had known the dowels couldn't extend for full support through the whole sword. Are your items officially licensed products? This is not an officially licensed product and is only considered FAN ART. Fan Art is protected under Fair Use. Do you have permission to print these Models? When purchasing the 3d models, we make sure there is no restriction against commercial use. For other files we have agreements with the model creator to sell kits. We do keep records of each file and such agreement/purchase record, if you have any questions please feel free to contact us. So if you have a file you wanted prints, we'd be happy to look at it and give you a price for what it would cost to print. We can regularly beat most other printer costs. Dont have a file? No worries, there is a vast network of files through Thingiverse and myminifactory (and others, even ETSY) we can help you search and we work with talented model creators who can make your custom design. Rush Orders are considered Custom Orders. Custom Orders are not available with sale discounts. I want "This Prop" for free, I will advertise for you though! I hate that I have to make this FAQ.... We do not give free props for "advertising." We do have an affiliate/sponsorship program, that we will offer to select indivuals. Interested? Please message us for Terms and Conditions. No, as they are made to be sanded smoothed and painted, the colors of the filament are not the color of the finished piece. We try to keep it to one or 2 colors, but there are times where we just have 5 or 6 random colors we have left over that may show up in your kit. If you would like your kit in a specific color please let us know, we can see what we can do, but there may be an additional charge. Will you Sell me the 3d file for this Item? If they are not on my store front, I do not sell the files that I use to print for a number of reasons. The Main reason is the license or agreement made by the modeler does not allow for commercial selling of the file. The other reason is that it is an exclusive print from Black Diamond Arsenal, to keep the exclusivity we do not provide these files. What will I receive as my unfinished kit? Full answer: You will receive a box packaged with all the parts that are 3D printed, casted or vacuum formed for your kit. These pieces will be unfinished meaning they will have seam-lines, print layer lines and may have flashing and other minor imperfections. We do try and remove as much supports (from the printing process) as possible but some may be left over. We will also repair some imperfections in the surfaces of the print with a spot putty. 3d printing is still in its infancy and these imperfections are bound to happen, the Putty we use is safe to sand, and will not be visable after the prop is finished. Any Questions on what we use feel free to message us. TLDR: You will receive a box of parts with minimal work done to them. I need this item very quickly, can you do it? Yes, But there will be an up-charge for a rush order. A rush order charge will be decided based off item and your time frame. All Rush orders are non-returnable, and are considered custom Orders. If your order is a prop of a weapon, Black Diamond Arsenal is not liable for custom & import laws of other countries. If your country has restrictions to Replica weapons, it is your responsibility to inform us of any precautions we need to take. We also do not directly collect any import taxes or fees. Any form of fees or taxes charged by imports of your country are your responsibility. Please give your order more time than it needs. A delay in shipping internationally can cause larger delays than average shipping, and delays in customs are common. Why does the PETG option cost more and whats the difference? Like most FDM 3D printing filaments, both are also thermoplastics. But they do have differences. Physical strength is generally higher with PETG compared to PLA. Temperature tolerance is typically much higher with PETG. Transparency is easiest to achieve with a PETG filament. With all this PETG also prints at a higher temperature, and slower. Which equates to more time and more electric use. It also costs more for the material. All of this put together means that we have to charge more to keep up with our costs.